Two Stern College for Women students in the S. Daniel Abraham Honors Program have recently been invited to join elite scientific programs. Jennifer (Sima) Grossman, a senior studying cellular and molecular biology, has been accepted to the American Society for Biochemistry and Molecular Biology (ASBMB) Honor Society, which recognizes exceptional undergraduates for their scholarly achievement, research accomplishments and outreach activities in the molecular life sciences. 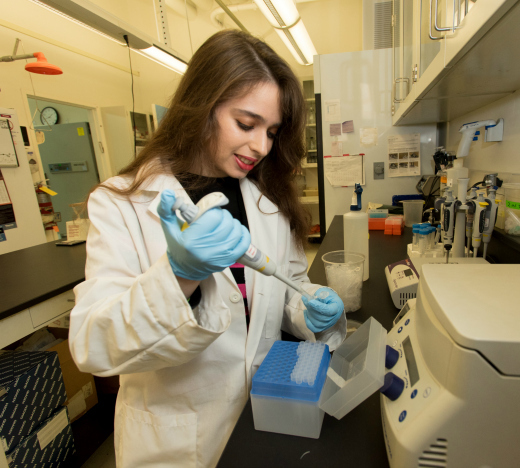 Grossman is currently a Henry Kressel Research Scholar working in the laboratory of mentor Dr. Marina Holz, the Doris and Dr. Ira Kukin Chair in Biology at Stern College, where she investigates how hormone receptors contribute to breast cancer development. She is also passionate about teaching science to others, especially children, through Project START! Science, an initiative founded at YU which mobilizes university student volunteers to teach hands-on science modules in public schools across New York City. In addition, Rina Leah Davidson, a senior studying neurobiology and president of Stern’s Neuroscience Society, has recently coauthored an article about her research at The Rockefeller University in Molecular Psychiatry and was accepted to Columbia University’s Amgen Scholars Program for the summer of 2016. The program seeks to increase learning and networking opportunities for students committed to pursuing science or engineering careers. Davidson’s research, which focuses on the effect of aging and Alzheimer’s disease on the brain’s memory center, is explored in the article “Age and Alzheimer’s disease gene expression profiles reversed by the glutamate modulator riluzole” and also forms the basis of her senior thesis in the Honors Program. At Stern, classes in neurobiology and behavioral neuroendrocinology with Dr. Amanda Mitchell, adjunct assistant professor of psychology, gave Davidson some of her first opportunities for hands-on scientific research, and Dr. Harvey Babich helped connect her with cutting-edge research opportunities such as her internship at Rockefeller. As an Amgen Scholar, she’ll be studying adult neurogenesis, the creation of new brain cells after puberty. “I’m really excited about it because it’s a promising and relatively new field of research,” said Davidson.